MemoryUp Personal is the lite edition of MemoryUp Pro. This handy Free RAM Booster takes a one-click approach. 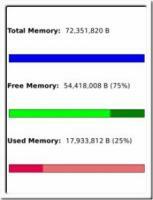 It makes more free memory available for your mobile system, accelerates memory responsiveness, and keeps your smartphone running fast and smoothly. All by one simple click. At the mean time, MemoryUp Personal is also a free mobile software and one of the best free Mobile applications on SlideME, Handango, MobiHand, CNET Download and etc.